When I left home earlier in the week, a bag of ice that we had bought for a pre-Christmas party lay at the back door. 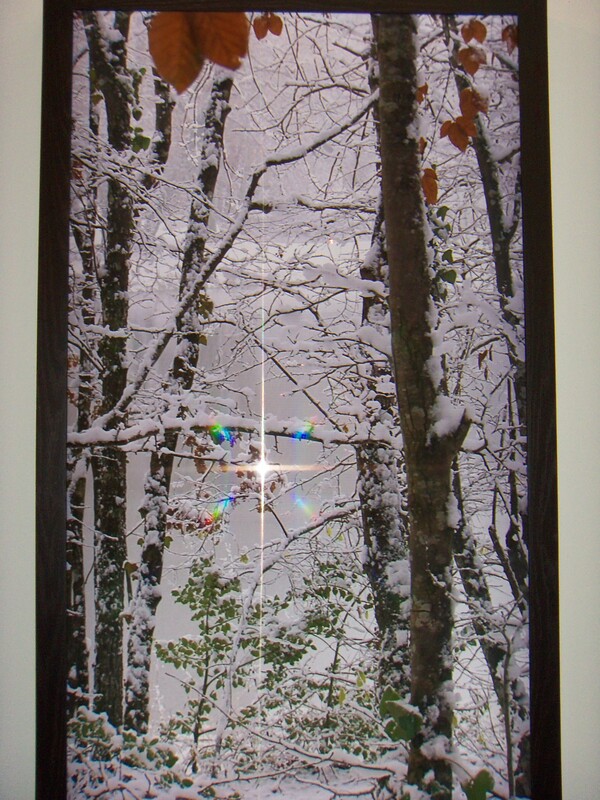 It had lain there facing the rising sun for a month. And most amazing, despite the sun and blue skies, the ice cubes were as square as the day they were born. 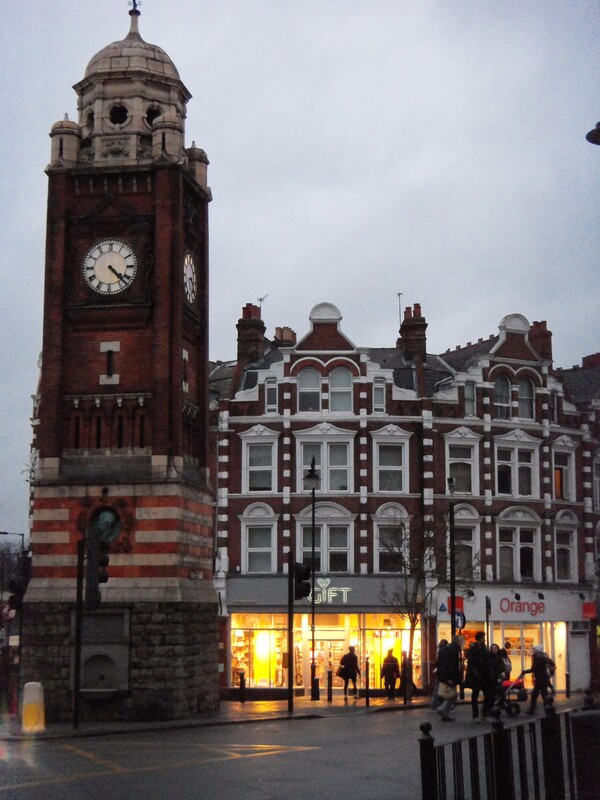 Crouch End clock tower at 4:20 p.m. In contrast, here in London, it is a balmy 52 degrees Farenheit. And yet, with no sense of proportion, the Londoners are bundled up and complaining about the chill. Perversely, I’d like to take them home to Colorado, strip them of their outer-wear, and let them experience cold as cold was meant to be. As for the overcast skies and the shorter darker days, I find the darker skies and the warmer weather a lovely contrast to the frozen white of Colorado. It is a nice change, and the contrast between the two countries heightens my appreciation of both. 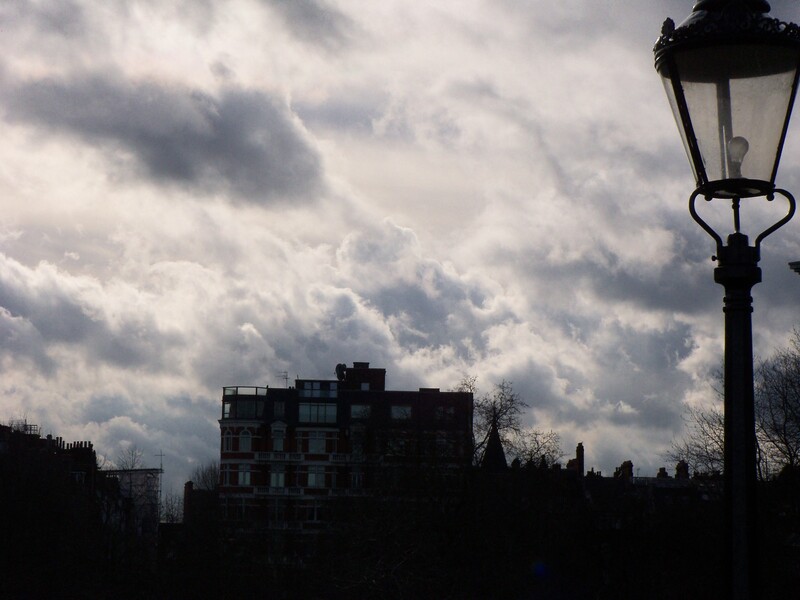 For the most part, London’s January sky is just a blank canvas of dishwater grey. But occasionally, a front moves in and the sky comes alive with apocalyptic drama. Look up and you expect thunder bolts and space ships and little green men who mean us harm. The sky portends earthquakes and tsunamis. No good can come of this sky. The picture to the right… was taken on Thursday, January 19. Pretty dark for 12:30 p.m. 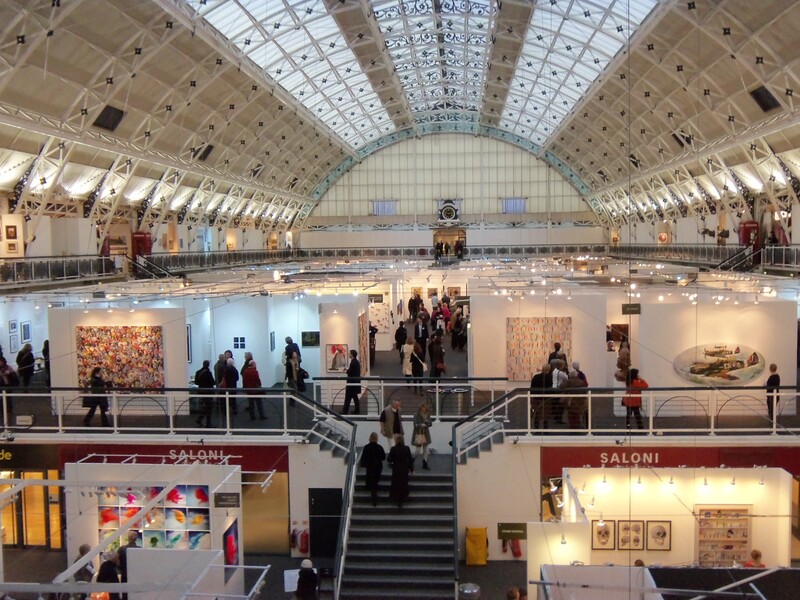 The Art Fair birds came in many guises. 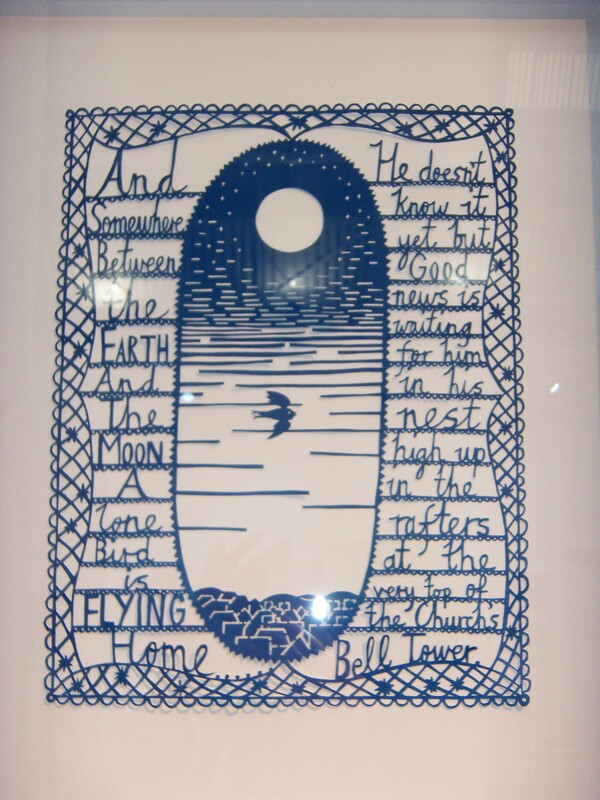 One exhibit that I liked in particular was the work of Rob Ryan who brought the old paper-cutting craft of Scherenschnitte (pronounced Sharon-sh-net) together with prose which was also cut. “And somewhere between the Earth and the Moon, a lone bird is flying home. He doesn’t know it yet, but good news is waiting for him in his nest high up in the rafters at the very top of the church’s bell tower.” I love the melding of the words and the image. 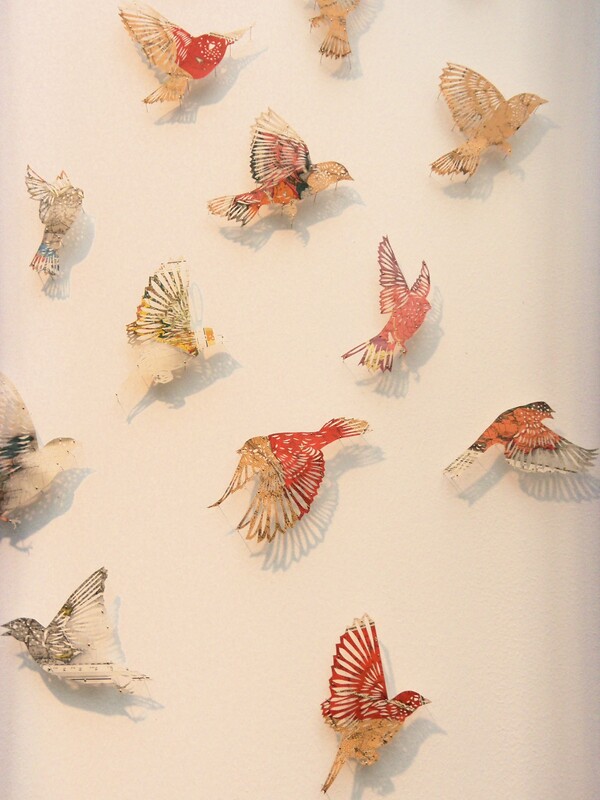 Claire Brewster‘s work, “The Harbingers,” also caught my eye. She too used a cutting implement as her artist’s tool. Using an old Times Atlas of the British Isles, she cut birds from a faded page. These birds were pinned directly to the wall. Next to the birds in flight, she framed the page from which the birds were cut. If you are curious about London prices, you could buy three birds for 800 pounds or (thinking in terms of the economy of scale) five birds for 1,200 pounds or $1,869 U.S. dollars. consider the work of Christopher Marvel. Could anything be more straight-forward than his “St. 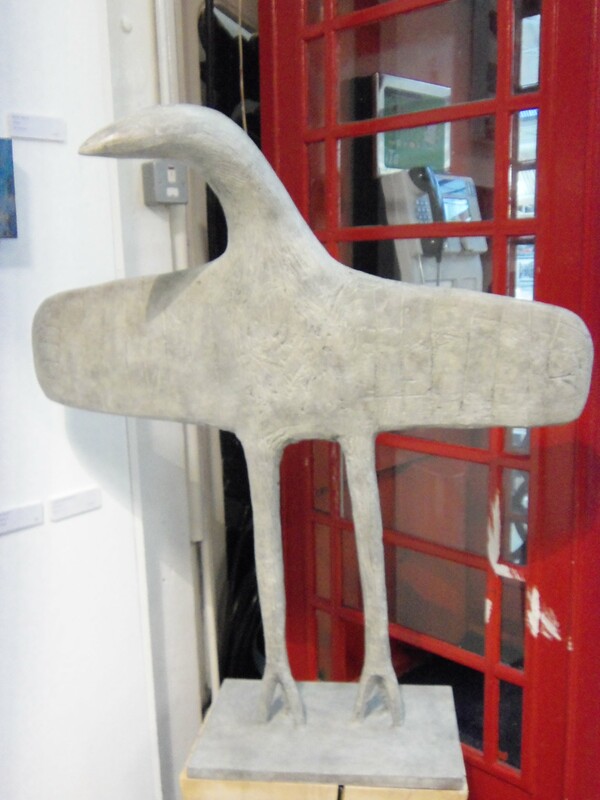 Ives Bird” in bronze? The lines are so clean. The bird feels fresh and free of artifice. Aside from birds, and there were many more than the ones I’ve already mentioned, I quite liked Jeffrey Blondes‘ installation of a woodland scene in high-definition filmed over 52 hours. It is winter. A few leaves hang on for dear life. The snow is heavy and wet. The snow is melting. I can hear the snow sloughing off… dripping. I wait for the leaf to drop. I get tired of waiting. I walk away to see other exhibits. I return. The leaf has dropped. I am disappointed. I wanted to watch it fall. I would like to install this scene in my house. I have never been good with meditation, but this work could do the trick. Using five different sections of the newspaper, randomly cut out five or six word phrases and incorporate these phrases in a short piece. This entry was posted in Uncategorized and tagged Christopher Marvel, Claire Brewster, denver Museum of Contemporary Art, Jeffrey Blondes, Jon Rubin, Khris Kenny, London Art Fair, Rob Ryan, writers' prompts. Bookmark the permalink. Wow, Doris, you are a hard worker! And you are such a good photographer that you really deserve a better camera. Do you remember if I saw Chris Kenny’s work as well? I love living in London (vicariously through you, my dear). Keep posting and I will keep reading and fantasizing about actually living in England. How about a cottage on the Welsh coast? I am clean, and a good cook. If you want to be quiet, I can do quiet. When do you want to do this? God, Doris don’t tempt me so. I guess I was visualizing this happening after Skye flies the coop in two years. And it is kind of a pie-in-the-sky wish. You have made me hopeful that my wish may come true. I am actually a baby about going to new places. T’would be nice if someone led the way. Returning to Colorado on the 10th. Bringing a page of holiday cottage rentals to fuel your desire. I’m always ready for a glass of wine. I’ll call when I’m home.